In a week dominated by two mega-stories—the continuing travails of Obamacare and the devastating typhoon in the Philippines—America’s hypercompetitive cable news outlets exercised very different news judgments. The health insurance saga took a dramatic turn when President Obama announced a change in the law to prevent individuals from having coverage cancelled. And frantic relief efforts continued in the Philippines, where the official death toll from Typhoon Haiyan reached the 4,000 mark as of Wednesday. A clear pattern in how four major cable news networks handled the competing stories emerged from a Pew Research Center analysis of 80 hours of programming from Nov. 11-15. The analysis studied one hour of midday and three hours of prime-time each day. The two channels with strong ideological identities in prime-time—liberal MSBNC and conservative Fox News—spent far more time on the politically-charged health insurance story than the overseas disaster. And the two organizations that built a brand on global reporting—CNN and Al Jazeera America, an offshoot of the Qatar-based Al Jazeera media network—spent considerably more time on the tragedy in the Philippines. The differences in the amount of coverage of each story on Fox News and MSNBC were striking. In the sample studied, MSNBC devoted three hours and eight minutes to the issues surrounding Obamacare, about four times as much as the Philippines typhoon garnered (41 minutes). On Fox, the differences were even greater. In the sample studied, the channel devoted almost eight hours to the health care drama and six minutes to the aftermath of the typhoon. That translates into nearly 80 times more coverage of the health insurance story than the typhoon. CNN had the closest balance between the two stories, spending slightly more than three-and-a-half hours on Obamacare and just under five hours on the typhoon. 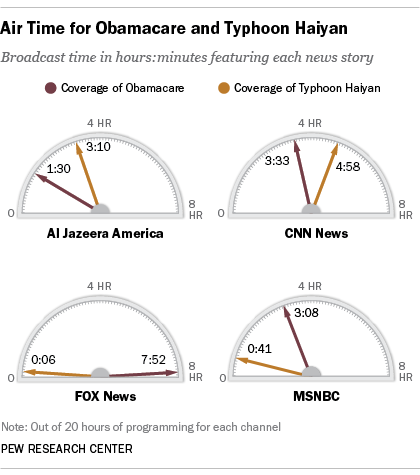 The fledgling Al Jazeera America network devoted three hours and 10 minutes to the typhoon, more than twice as much airtime as health insurance commanded (one-and-a-half hours). For those trying to read the tea leaves on Al Jazeera America’s editorial vision, the international focus of that coverage seems somewhat in contrast to the results of our earlier study that found the channel’s coverage of a crucial week of the Syrian crisis tended to have a domestic focus, devoting the biggest chunk of its coverage to the debate in the U.S. over whether it should become militarily involved in Syria’s civil war. Al Jazeera America stood out in another way last week. In the sample studied, it offered by far the least amount of opinion (41%) when it came to commentary and opinion versus reporting or fact-based statements. That compared with 72% opinion on CNN, 86% on MSNBC and 97% on the Fox News Channel. While those numbers suggest that Al Jazeera America may be trying to distinguish itself editorially from its competitors, the audience data indicate that at this point, not many people are watching. You can find the methodology for this analysis here.